This companion to the third edition of Christian Counselling will help readers apply their knowledge to real cases. Each chapter presents a story or stories that illustrate the material discussed abstractly in Christian Counselling, and includes three sets of questions to help individuals and groups explore the subtleties and details of the material. 224 pages, from Thomas Nelson. This companion to the third edition of Christian Counseling will help readers apply their knowledge to real cases. It presents stories that illustrate the material that is discussed abstractly in Christian Counseling. 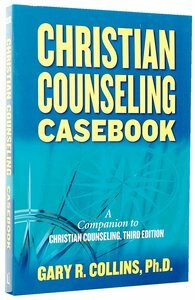 ^Each chapter begins with a brief introduction followed by the case story or stories and three sets of questions designed by Gary Collins to help the reader or group explore the subtleties and details of Christian Counseling. The Discussion Questions focus primarily on the case and raise questions about how the counselee might best be helped. The General Questions focus more broadly on relevant issues that are suggested by the presented case but may extend beyond the case. The Personal Reflection Questions are written for the reader/counselor to reflect on ways in which the case and the topics under discussion could apply personally to the reader. Dr. Gary R. Collins (Ph.D., Purdue University) is a licensed psychologist who served for twenty years as professor of psychology at Trinity Evangelical Divinity School. He is author of more than 170 articles and about 45 books, including Christian Counseling: A Comprehensive Guide (Third edition), The Biblical Basis of Christian Counseling; Casebook of Christian Counseling and Family Shock: Keeping Families Strong in the Midst of Earthshaking Change. Most recently he has produced Christian Coaching: Helping Others Turn Potential into Reality and How To Be A People Helper.